Zorell, Carolin V. 2019. Varieties of Political Consumerism. p. 77. Preston, Christopher and Carr, Wylie 2019. Recognitional Justice, Climate Engineering, and the Care Approach. Ethics, Policy & Environment, p. 1. McKeown, Maeve 2018. International Encyclopedia of Ethics. p. 1. Schlaile, Michael P. Mueller, Matthias Schramm, Michael and Pyka, Andreas 2018. Evolutionary Economics, Responsible Innovation and Demand: Making a Case for the Role of Consumers. Philosophy of Management, Vol. 17, Issue. 1, p. 7. Aragon, Corwin and Jaggar, Alison M. 2018. Agency, Complicity, and the Responsibility to Resist Structural Injustice. Journal of Social Philosophy, Vol. 49, Issue. 3, p. 439. Byrd, Marilyn Y. 2018. Diversity Branding Strategy: Concealing Implicit Stereotypes and Biased Behaviors. Advances in Developing Human Resources, Vol. 20, Issue. 3, p. 299. Árnason, Vilhjálmur 2018. The Return of Trust? Institutions and the Public after the Icelandic Financial Crisis. p. 173. Dowler, Lorraine and Ranjbar, A. Marie 2018. Praxis in the City: Care and (Re)Injury in Belfast and Orumiyeh. Annals of the American Association of Geographers, Vol. 108, Issue. 2, p. 434. Vears, Danya F. and D’Abramo, Flavio 2018. Health, wealth and behavioural change: an exploration of role responsibilities in the wake of epigenetics. Journal of Community Genetics, Vol. 9, Issue. 2, p. 153. McKeown, Maeve 2018. 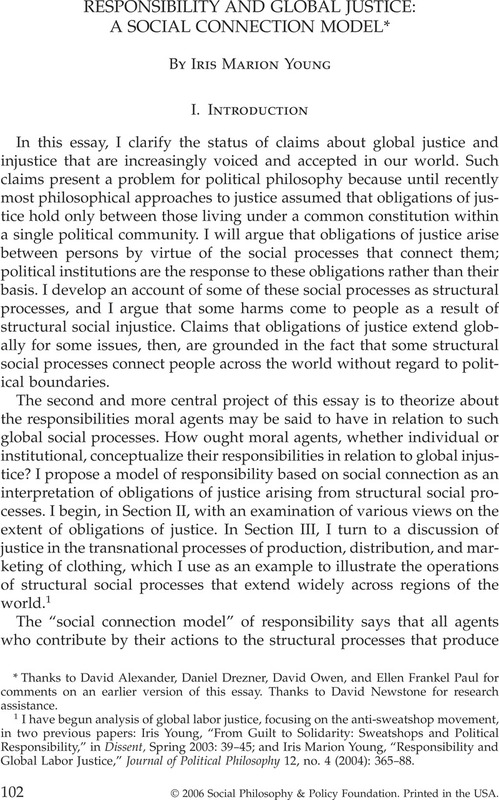 Iris Marion Young’s “Social Connection Model” of Responsibility: Clarifying the Meaning of Connection. Journal of Social Philosophy, Vol. 49, Issue. 3, p. 484. Coman, Adela and Grigore, Ana-Maria 2018. Social Computing and Social Media. User Experience and Behavior. Vol. 10913, Issue. , p. 203. Schiff, Jade Larissa 2018. Welcoming Refugees: Mindful Citizenship and the Political Responsibility of Hospitality. Signs: Journal of Women in Culture and Society, Vol. 43, Issue. 3, p. 737. Boillat, Sébastien Gerber, Jean-David Oberlack, Christoph Zaehringer, Julie Ifejika Speranza, Chinwe and Rist, Stephan 2018. Distant Interactions, Power, and Environmental Justice in Protected Area Governance: A Telecoupling Perspective. Sustainability, Vol. 10, Issue. 11, p. 3954. Turcu, Catalina 2018. Responsibility for Sustainable Development in Europe: What Does It Mean for Planning Theory and Practice?. Planning Theory & Practice, Vol. 19, Issue. 3, p. 385. Browne, Paul Leduc 2018. Reification and passivity in the face of climate change. European Journal of Social Theory, Vol. 21, Issue. 4, p. 435. Stevis, Dimitris Uzzell, David and Räthzel, Nora 2018. The labour–nature relationship: varieties of labour environmentalism. Globalizations, Vol. 15, Issue. 4, p. 439. Ravazzani, Silvia and Mazzei, Alessandra 2018. Employee Anonymous Online Dissent: Dynamics and Ethical Challenges for Employees, Targeted Organisations, Online Outlets, and Audiences. Business Ethics Quarterly, Vol. 28, Issue. 02, p. 175.